I was recently asked how long does something have to go for, for it to be considered a tradition. I answered ten years because once you’ve gone past the decade there’s a feeling of ‘let’s keep it going’. 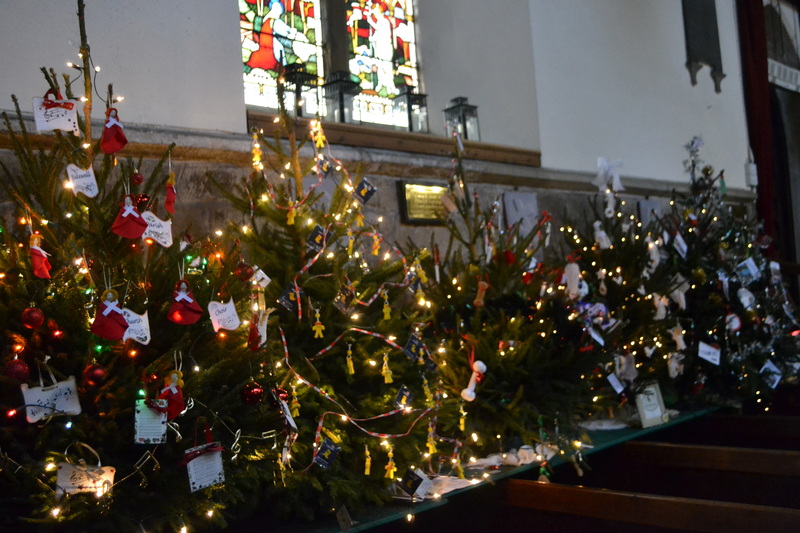 Christmas Tree festivals appear to be the fad new fashion of the 21st century…last century I had never heard of them…now search for them on-line and you’ll find one in virtually all the counties of Great Britain! The website http://www.christmastreefestivals.org/ has 176 of them recorded. It is difficult to pinpoint the exact origins of this modern custom. The oldest I can find go back to the mid 1990s such as those of Hitchin, Hertfordshire and Brighstone on the Isle of Wight. Further back and we get an answer of where this custom arose from – festivals over 24 years are firmly US based. But why start them? It seems curious that the modern church, protestant and Catholic could be combined with celebrating such a pagan thing as a dressed tree – a tradition linked to pagan tribes from the Romans to the Celts. They appeared soon to be Christinanised being adorned by fruits and nuts such that by the 1500s they were being brought into the house, popularised by Martin Luther who encouraged fir trees to be brought into the house and lighted by candles on the branches. By 1800 it had become popularised in the UK, its famed being cemented by Victoria’s Prince Albert. Since then the Christmas essential for every house, shop, mall, restaurant and everything in between, was the fir tree -real or fake! It is quite remarkable how quickly both this custom has spread and how popular the customs have become locally. The best example of this can be seen at Melton Mowbray in Leicestershire. In 2016 it topped 1378 different trees and thus became the largest collection in the country. A good tourist attraction for the town in a time of year in which tourists may well be thin on the ground. Of course, churches are constantly looking for something to reconnect what is slowly becoming a secular celebration to its Christian original message (leaving aside for a moment its hijacking of the pagan one!) The Christmas tree is a focal point. 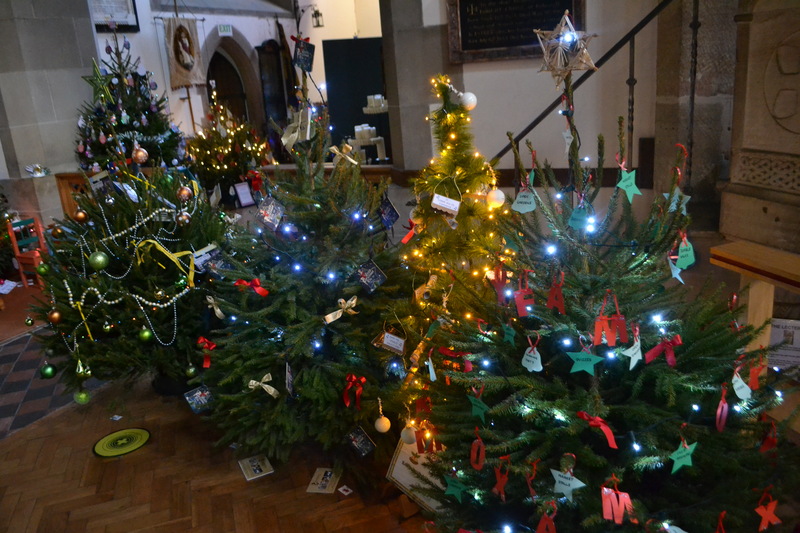 Everyone likes a colourful Christmas trees, being establishing such a festival not only brings communities together, after all everyone can dress a tree and there is no set way to do it, but brings people in. 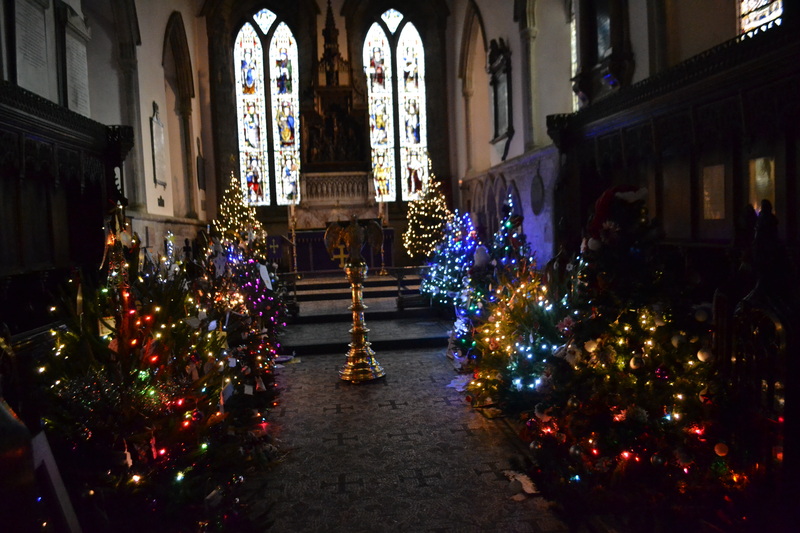 Walking into a church there is something indeed magical about the array of trees glistening and sparkling in the gloom. One is reminded of the magic of the season and the creativity of the people responsible. A new custom yes, but one based in an old tradition and one which is very welcome to add to the custom list. In Bradninch, Devon the tradition has been to burn Christmas trees on 6th January on a communal bonfire following a procession of lanterns and giants through the town. The procession starts in two separate places and converges on the Guildhall where the crowd demand the Mayor gives them the Christmas tree which after a short speech he/she throws down. A cleansing fire event. Thanks for the reminder on this I had heard about it but forgotten. I’ll put it in the diary for next year as I plan to do the Bodmin Wassail what time does it start?